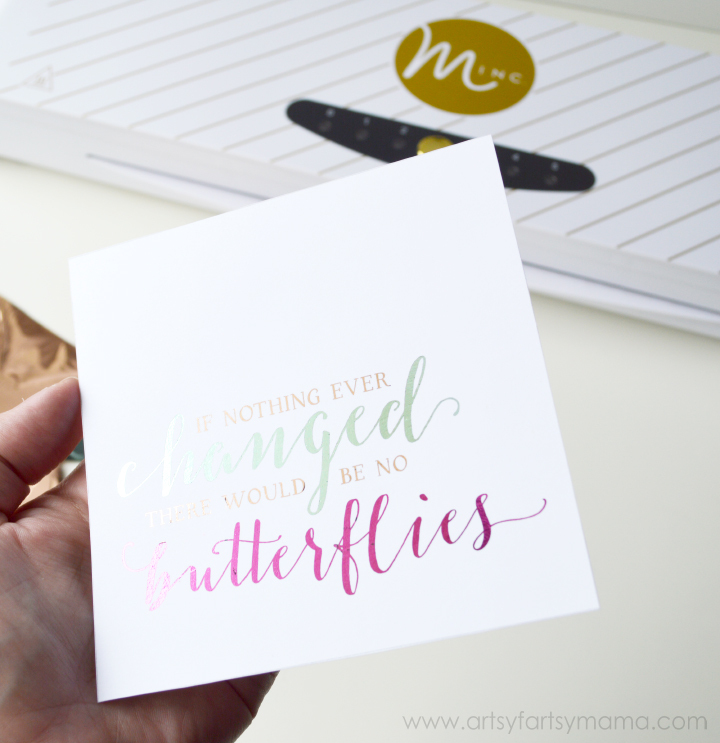 My daughter loves butterflies, so I decided to create some foiled wall art for her to hang in her bedroom using the oh-so-amazing Minc machine!! I'm so excited to share this project tutorial with you and hope that you love it as much as I do! If you haven't heard, the Minc is an incredible a crafting tool that turns laser printed items (both pre-made or your own custom designs) into a beautifully foiled creation in just seconds. You can see more in my previous post introducing the Minc and showing what it can do! Though there are tons of ways to foil projects, none are as easy and quick as using the Minc. For this project, I used the Minc machine and gorgeous Minc foils in mint, hot pink, pink, and rose gold. 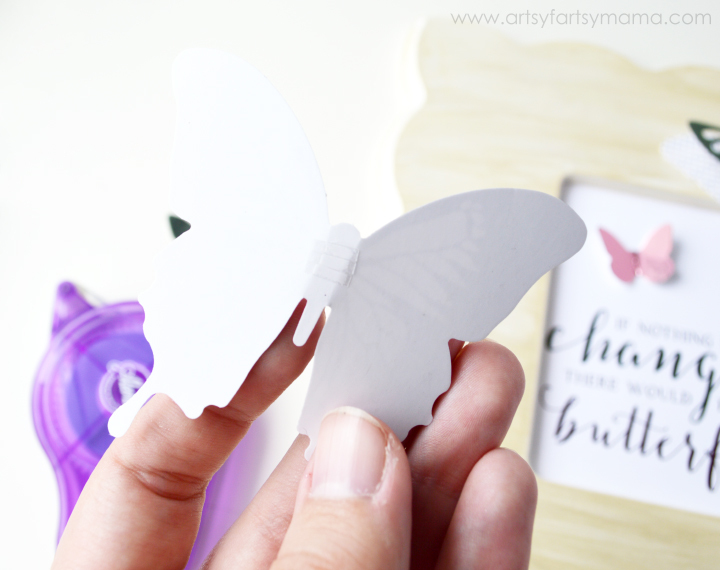 I also used Minc 3D Paper Butterflies, and my own design for inside the frame. You'll also need a frame, paint (if your frame is unpainted), and Glue Dots or tape runner. 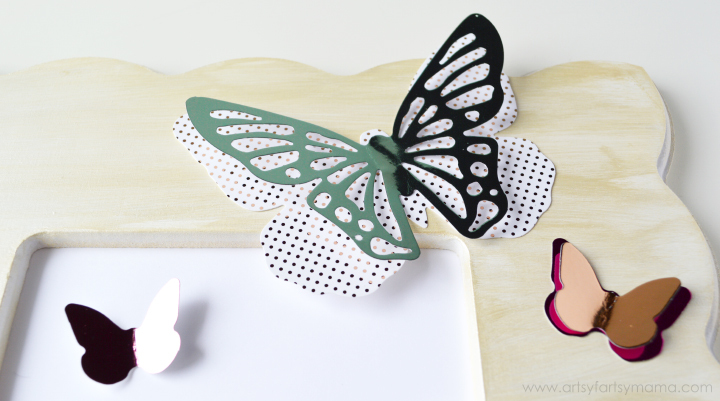 The Minc 3D Paper Butterflies pack comes with 32 butterflies in multiple sizes and patterns to create lots of unique butterfly combinations. 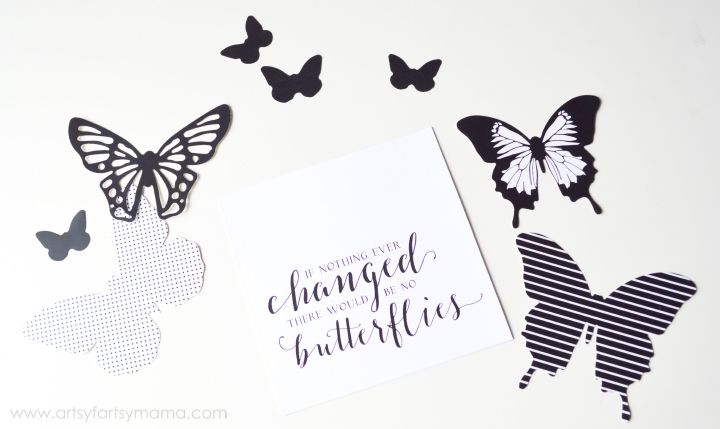 I also designed a butterfly quote to go inside my frame, and wanted to share it with all of you as a free printable. If you have a Minc, feel free to print this printable out on a laser printer and cover it in your favorite color foils!! Now, let's get started! Turn on the Minc machine and set the heat setting to 3. 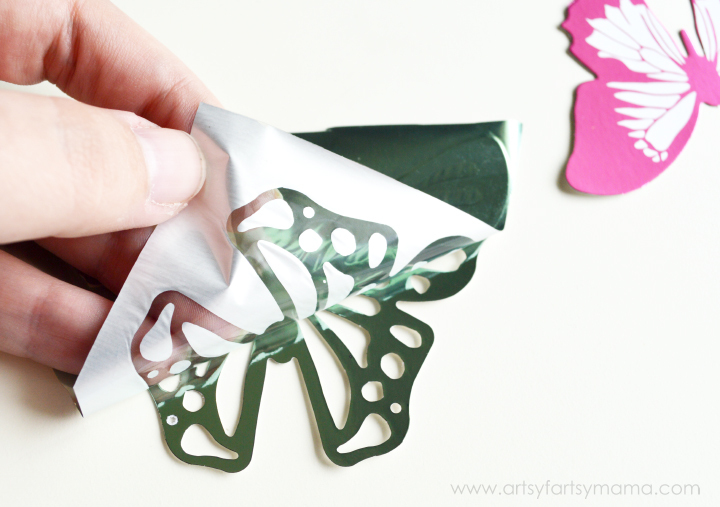 Cut pieces of foil to cover all the butterflies with sharp scissors (dull scissors do not cut the foil well). Open the carrier sheet and place the butterflies face up. Carefully lay the foil pieces over the butterflies (color side up) and lightly press down and make sure none of the black parts of the butterflies are uncovered. Carefully lay the top of the carrier sheet down over your project and smooth it out with your hand. Place the carrier sheet into the Minc machine until you feel the rollers grab it. The machine will do all the work - all you have to do is sit back and wait for it to completely run through the machine. After it cools (it only takes a few seconds), carefully lift the top of the carrier sheet and remove the butterflies. Starting at one corner, slowly pull up the foil. Remove the foil from the rest of the butterflies. Now the butterflies have gone from black and white to shiny, gorgeous, and chic!! Since the butterflies come in different shapes, sizes, and patterns, it's fun to mix and match unique butterfly creations. To give the butterflies a more 3D effect, slightly bend the wings up. If using two layers, I kept the bottom layer flat, and placed the bent butterfly on top. 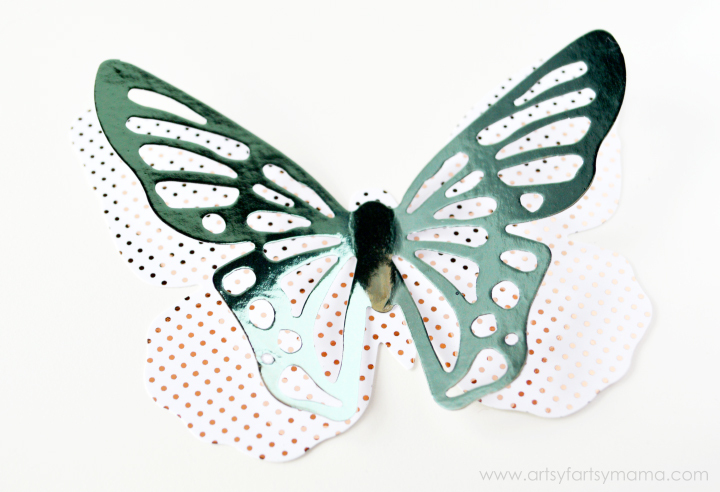 Stick your butterflies together with Glue Dots or a tape runner. Next, paint your frame (if you need/want to) and arrange the butterflies to your liking. 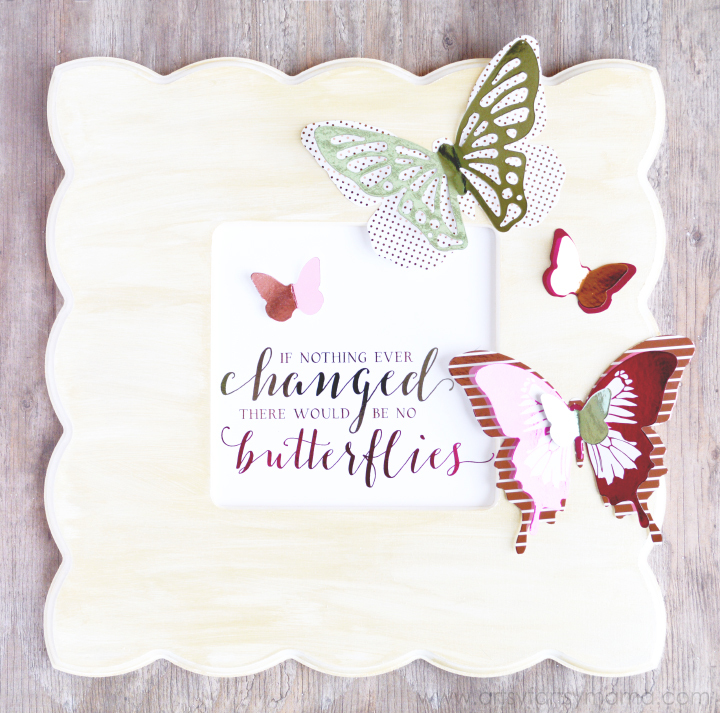 Once you have the butterfly arrangement you want, place a Glue Dot or a little bit of tape runner on the back of the bottom butterflies and stick them to the frame. This will stick them on really well, but will still give you the option to remove them later if you decide to use them for something else. For the print, I wanted to make it multi-colored. So, I cut pieces of foil to cover each of the words in the colors I wanted them to be. I used rose gold on the smaller letters, and mint and hot pink on the "changed" and "butterflies". I'll be completely honest - with this smaller print, it was a little tricky to keep the foil in place while on carrier sheet because of the static. But don't give up - it's definitely doable!! Just be patient and try to hold smaller pieces down while you slowly place the top part of the sheet back down. Place the print into the frame, hang it on the wall and enjoy your beautiful foil butterfly wall art!! This is one of the reasons why the Minc is one of my new favorite craft tools - your only limitations with this machine is your imagination! 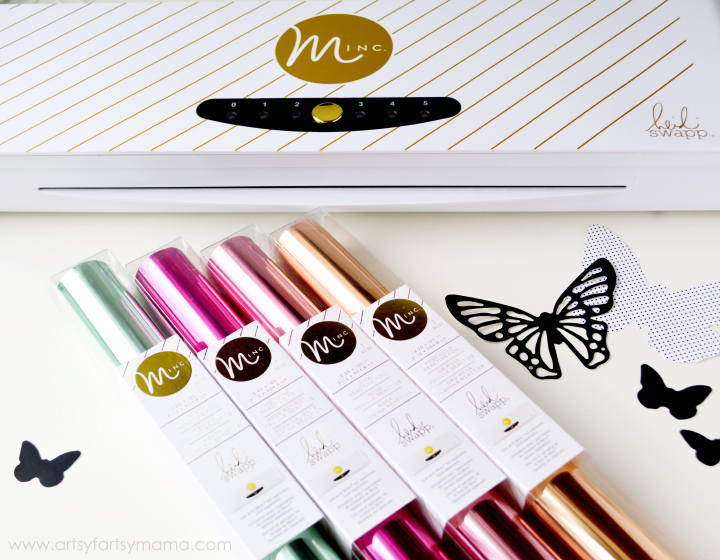 You can find the Minc machine and accessories (like the 3D paper butterflies) are available at Hobby Lobby and Jo-Ann, as well as local stores and online shops. I love this! Definitely need a Minc now! That looks great! I've never heard of this machine. I'll have to look it up. Such a gorgeous project! I agree that it's hard to get really small pieces to stay in place but the look is totally worth it! I love that you used the Minc for wall art! I have seen a lot of projects and this is one I think I might actually make! beautiful! Oh my gosh, my Aunt would LOVE this!! Birthday gift idea, thank you so much for the inspiration!! I love this! Beautiful quote! And using the minc to foil it makes it just perfect! That's absolutely gorgeous! I love butterflies too! I keep seeing this machine around the blogosphere and I think I need it!